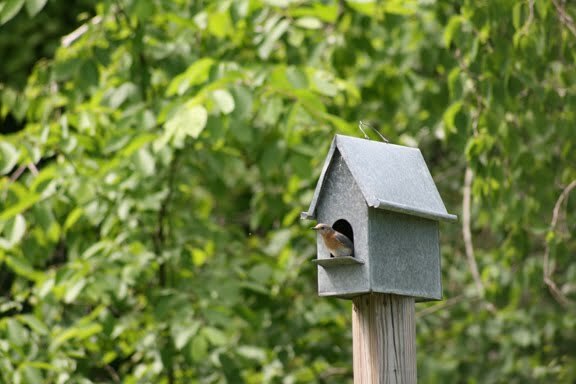 Located between forest and field and filled with berry-producing shrubs, my backyard has become home to a variety of birds throughout the years. When summer foliage fills in and hides the house next door, birds are our only visible neighbors — and I'm not embarrassed to admit we spy on them every chance we get, with binoculars and telephoto lenses. 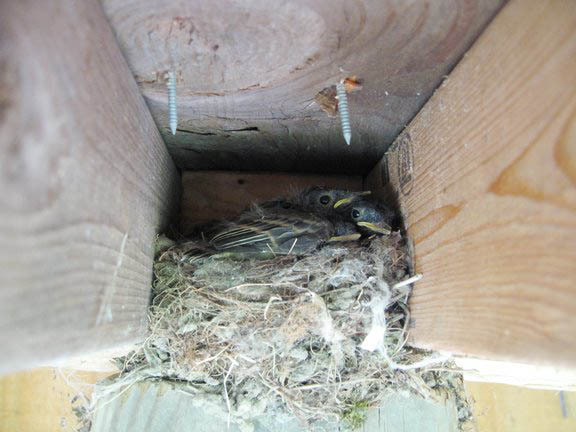 Last year phoebes, who prefer to nest on a platform, constructed a nest in the woodshed. One sunny afternoon while I was gardening near the shed's entrance, a fledgling decided to take advantage of having a soft spot to land on and launched himself onto my shoulder. All three successfully left the nest that day and were soon perched with their anxious mother in the low branches of a nearby shrub. I was happy to have helped. 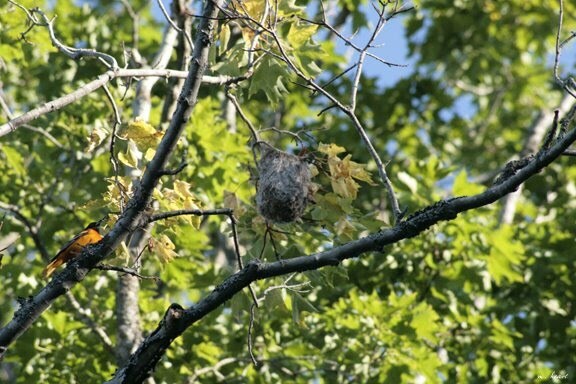 Baltimore orioles wove a hanging basket in a maple above a perennial bed (in the photo above the oriole is off to the left of the nest) and raised their family in its high branches. In The Bird Watching Answer Book, Laura Erickson (check out her bird blog here) describes the oriole's construction process in detail. 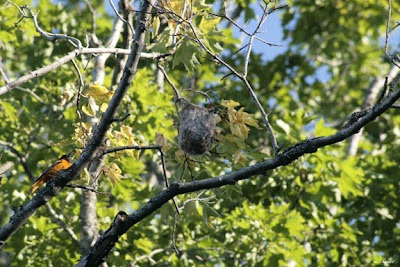 The Baltimore oriole female builds her complicated hanging nest in three stages. First, she constructs the outer bowl of flexible plant, animal, or human-made fibers that can be very coarse — these provide the structural support. After she's put together the basic skeleton, she often works from inside the nest adding more fibers, especially as she moves on to the next stage. At that point, she begins weaving more springy, flexible fibers into an inner bowl, which fills in spaces and maintains the nest's shape. Finally, she adds downy fibers to line the nest. It usually takes her about a week to build the nest. 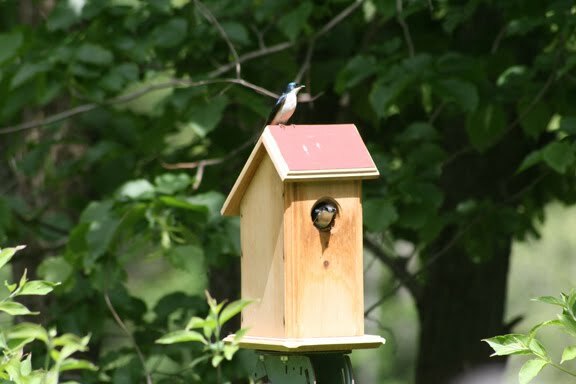 This year we were shocked to see a pair of Eastern bluebirds occupying a galvanized box that sits atop a post at the corner of the vegetable garden. Within the past week their babies have hatched, and the parents are busy catching bugs and moths to deliver to hungry mouths. House wrens nest inside old downy woodpecker or chickadee cavities, inside bird boxes, and inside all manner of other small spaces. Wrens have successfully nested inside old boots, overall pockets, truck axles, fish creels, and cow skulls. The male chooses as many potential nest cavities as he can find, covering the bottom of each with a platform of small sticks. The female chooses the one most to her liking and finishes building the actual nest in a depression in the stick platform; she lines this cup with soft materials. 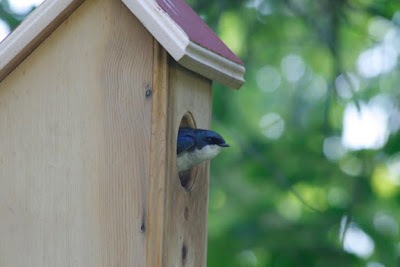 One of the houses the wren female rejected was quickly occupied by tree swallows. Do you have any feathered neighbors this year? Tell us about them! 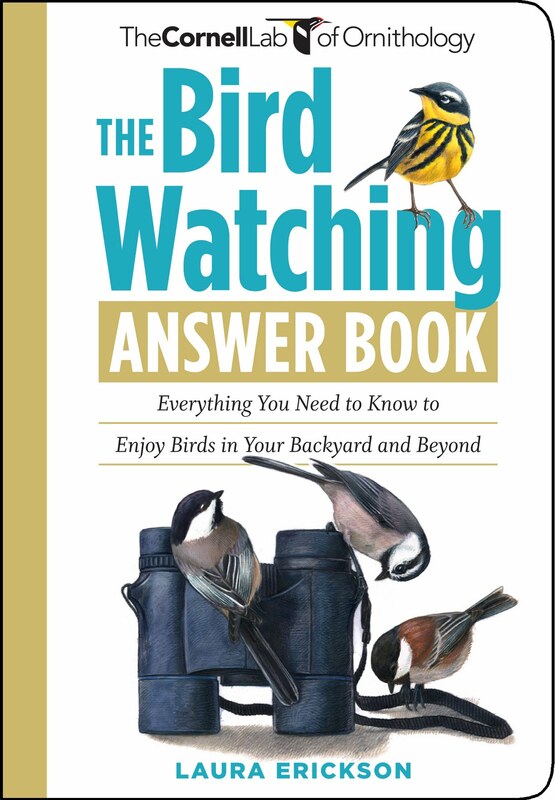 The first five readers who send bird-related comments will receive a free copy of The Bird Watching Answer Book! Yesterday I saw a bird which was new to me. I've no idea what it was. It was a small bird with kind of long legs. The tail was white with a sort of caramel colored bar across it. The main color of the bird was a light tan/grey but there was more white and caramel on the head. Maybe this book would help me identify it? I have seen lots of Cardinals at the bird feeder lately. I'd like to be able to attract hummingbirds to the backyard also. I have several different types of birds at my house. I have a robin that likes to perch on the very top of the roof (I have an A-Frame style home) and watch me as i work in the garden. There is also an owl that likes to perch up there and hoot at night. I can hear him when he lands on the roof! Hi Charlotte! Though this book won't necessarily help you to identify birds, once you know what they are it will definitely help you figure out what it is they're doing, and why! Lots of Cardinal 'couples' - a surprising number for the city!